In the former Mukachevo eparchy there were several miraculously weeping icons of the Most Holy Mother of God [Theotokos], venerated by our Carpathian ancestors with great devotion and love. The Blessed Mother, seeing the many sufferings of our oppressed people, sympathized with them in a visible manner, miraculously shedding tears in various places, like in Klokochovo, Mariapovch, Krichevo, Mikula and Pavlovo. The oldest of them was that in Klokochovo, presently in Eastern Slovakia, shedding tears in 1670. 1. Klokochovo (Hung. Hajagos; Slav. Klokochov) in the XVII century was a small Ruthenian village, nestling in the foothills of the majestic Vihorlat mountain. It belonged to the Staray noble family of Michalovci, to whom the villagers were subject as to their feudal lords, obliged to work on the Starays’ lands. In the middle of the village was a small wooden church, dedicated to the Dormition of the Holy Mother of God. Those were times of constant wars, when the Hungarian Protestant nobility, supported by the Turks, conspired to free Hungary from the Habsburg rule, backed up by the Hungarian Catholic aristocracy. The Carpathian region became their battlefield, since at that time the lower central part of Hungary was occupied by the Turks. Thus our Ruthenian population, tied to the feudal soil, suffered much violence and cruelty from soldiers of both sides, who pillaged and burned down our churches, monasteries, even entire villages. In 1670, the Protestant “crusaders” (Hung. kurucok). as they liked to be called, during their campaign against Michalovci, were approaching Klokochovo. The people, seized by fear, ran into the church to implore protection of the Blessed Mother, whom they venerated as the “refuge of Christians.” As they were praying, they noticed that the icon of the Blessed Mother was shedding tears. Moved by the weeping icon to tears, the villagers continued to pray. All of a sudden the church door flung open and the Calvinist “kurucok” invaded the church. Yelling and shouting, the soldiers started to destroy the crosses, the church banners, and other religious objects. It happened that one of the enraged soldiers, when he noticed that the icon of the Blessed Mother in the iconostasis was shedding tears, pierced the icon with the bayonet fixed to his rifle. But the tears continued to flow and more profusely. Irritated, the soldier began cursing, tore the icon out of iconostasis and threw it on the floor, ready to trample it. But the people, unable to stand such profanation, pushed the furious “kuruc” aside, and one of the parishioners picked up the icon and ran with it into the woods. 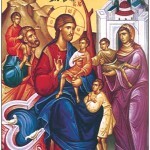 In their anger the soliders burned down the church, but the miraculous icon was saved. 2. After the Protestant “crusaders” left the region, the parishioners took the weeping icon of the Blessed Mother to the town hall in Prjashev and asked the magistrate to preserve their precious icon until they could rebuild their church. The hereditary count of the Sharish district, which included the town of Prjashev, was the Rakoczi family, who resided in the Mukachevo castle. Since the heir of the Rakoczi’s possessions, Prince Francis I Rakoczi, was still a minor, the administration of the Rakoczi’s fortune was in the hands of the prince’s mother, Countess Sophia nee Bathory. The countess, after the death of her Calvinist husband, Prince George II Rakoczi, became a fervent Catholic and was very well disposed toward our people and our Church. According to the leading Carpathian historian Father Michael Luchkay (1789-1843), Countess Sophia Bathory not only granted freedom from servile work to our clergy in accordance with the canonical privileges, but also ordered all her officials to respect the Byzantine rite feastdays and not to force the people to work on those days. The Countess herself became fond of our Byzantine rite and, trying to give a good example to the Ruthenian people, she often attended Holy Liturgy in our churches. She even became familiar with the Old Slavonic language to be able to follow our Liturgy and left behind the Old-Slavonic Prayer Book, printed in 1679, with her own signature. When the countess heard about the weeping icon of the Blessed Mother in Klokochovo, she became very excited about the miracle. Being the hereditary countess of the Sharish district, she simply ordered the municipality of Prjashev to hand over the icon to her. Thus the miraculous icon was transferred to the castle of Mukachevo, where the countess lived with her son Francis, and placed over the altar in the chapel. The Countess Bathory became greatly attached to the miraculous icon and lavishly decorated it with precious stones and costly drapery. 3. After the death of Countess Sophia Bathory (+1680). the miraculous icon of Klokochovo remained in the Rakoczi family chapel in the Mukachevo castle, since the wife of Prince Francis I Rakoczi, Countess Helen nee Zrinyi, also became fond of it, considering the icon was a family treasure. After the early death of her husband, Countess Zrinyi became sole administrator of the Rakoczis’ possessions, since her children, Julia and Francis II, were only infants. In 1682, Countess Zrinyi remarried and became the wife of the leader of the Hungarian insurrection, the famous magnate Emeric [Imre] Thököly. But in a short time he was defeated by the imperial army and had to take refuge in Turkey. In 1688, Countess Helen Zrinyi, after the castle of Mukachevo was seized by the imperial forces, as wife of Thököly, was permitted to join her husband in Nicomedia (presently Izmit) Turkey, and to take with her all the family treasures. The inventory of items taken by the countess to Turkey says: “Among the precious things the countess took with her was a much venerated icon, representing the Blessed Mother of God, which several years before Countess Sophia Bathory obtained from Klokochovo and which was venerated in the chapel of the Mukachevo castle. The Blessed Mother and Child Jesus sparkled with countless precious gems that adorned the icon.” After the death of Helen Zrinyi (+1703), her son from the first marriage, Prince Francis II Rakoczi, heir of the Mukachevo castle and estate, brought back the miraculous icon of Klokochovo from Nicomedia and placed it back in the family chapel of the Mukachevo castle. In 1703, Prince Francis II Rakoczi also started an insurrection against the Habsburgs. After a long campaign he also was defeated and had to seek asylum in Nicomedia. The castle of Mukachevo was recaptured by the imperial forces on August 11, 1711. Then all the treasures of the Rakoczi family were confiscated and taken to the imperial court in Vienna. Among the confiscated item was also the miraculous icon of Klokochovo, which was then placed in the private chapel of the imperial palace. 4. The magistrate of Prjashev insisted that the miraculous icon be returned to the city hall, from where it was taken away by Countess Sophia Bathory. But Emperor Charles VI refused to comply. On the back of icon there was a signature of the Viennese artist who made the copy: F. Kramer, 1769. The copy of the Klokochovo icon hung on the wall of the city hall in Prjashev for long time, but in 1904 it was donated to Bishop John Valyi of Prjashev. After restoration, the icon was then solemnly enthroned in the bishop’s chapel on August 12, 1907. 5. Now the parishioners of Klokochovo insisted that Bishop Valyi give the icon to the ir church, where the miracle happened in 1670. But the bishop would not part with the icon. He rather commissioned our famous Carpathian artist, Ignatius Roshkovics (+1915), to make another copy, which he then donated to the church in Klokochovo. Thus, starting with 1913, Klokochovo became one of the main pilgrimage places of the Mukachevo eparchy. During World War II, the pilgrimages in Klokochovo considerably declined, since the church and parish house were badly damaged. Then in 1945, due to the political changes, the parish of Klokochovo was separated from its mother eparchy by new borders and placed under the jurisdiction of Bishop Paul Gojdich, OSBM. of Prjashev. It was then that Father John Chekan was appointed the pastor of the Klokochovo parish. In a short period of time he rebuilt the church and the parish house, obtained new indulgences from Rome, and thus the pilgrimages were resumed in 1946. During the following year more than 40,000 pilgrims came to Klokochovo to venerate the Blessed Mother in the place where, in 1670, she shed her bitter tears in sympathy with the sufferings of our people. 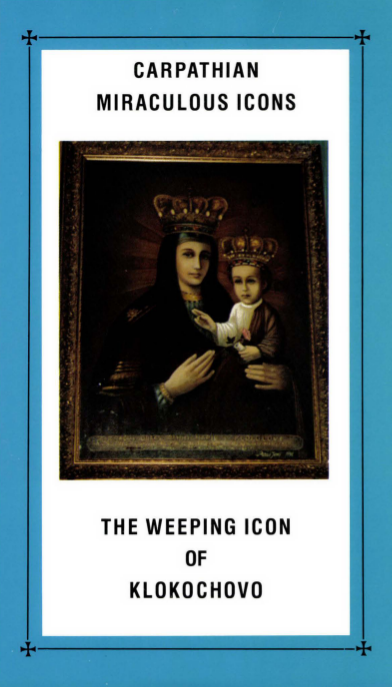 In order to enhance the public veneration of the Weeping Icon, Father Chekan had the icon crowned in 1948. The solemn coronation of the icon was performed by the Auxiliary Bishop of Prjashev, Basil Hopko (+1976). This was the last pilgrimage, since the following year the pilgrimage was forbidden by the Communist authorities. What happened to the original icon of Klokochovo? Nobody can tell. Some research was made in the imperial palaces in Vienna, especially in the apartments of Maria Theresa, but the icon could not be found. Probably, after the fall of the Austrian empire, some devoted member of the imperial family has taken it as a precious family remembrance . Will it be found? Perhaps the Blessed Mother will honor us with another miracle and reveal to us the whereabouts of her weeping icon of Klokochovo. In connection with the miraculous icon of Klokochovo it should be mentioned that in 1885, in the village of Kamionka, Spish district, an old handwritten Song Book from 1724 was discovered. Among the spiritual songs a longer poem, entitled “Song About the Icon of Klokochovo,” has been found. The poem was composed shortly after the miracle, in about 1683 (cf. the first 4 lines at the beginning), and is a certain proof of the miracle. The present church in Klokochovo, was built in 1834. In 1913, after the acquisition of a true copy of the miraculous icon and after obtaining various indulgences from Pope St. Pius X, it became a famous pilgrimage place in the eparchy of Mukachevo. During World War II the church was badly damaged, but the sidewall with icon remained intact. It was rebuilt by the newly appointed pastor, Father John Chekan, in 1945. He revived the pilgrimages in honor of the Blessed Mother, especially on her feastdays of Dormition and Presentation. After a solemn crowning of the icon in 1948, the pilgrimages were interrupted by the Communist authorities. After the forced liquidation of the Greek Catholic Church in 1950, the Orthodox seized the church, but even they were not allowed to have pilgrimages. In 1968, the church was returned to the Greek Catholics, but the pilgrimages were resumed only after the “velvet revolution” of 1989.